The water is home to immensely beautiful creatures. Clown loach is one outstanding example. Wonder of wonders is that it is food to a given population in the planet. Well, if beauty can satiate hunger, so be it. 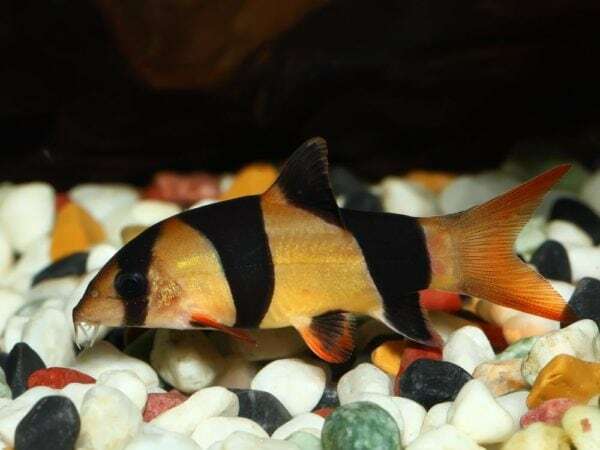 Clown loach belongs to the schooling fish species. They make a lovely scene when in groups of fours or fives. If kept under required tank conditions, the fish can be very entertaining. Since it is a peaceful tank animal, it can easily coexist with other fish species with the same temperament. The fish has a long slender profile that helps it cruise through the water. Across its body are bright orange and yellow markings that are separated by 3 black stripes. They are commonly mistaken for tiger barbs. The fish spots a long nose that is sharply pointed. It is surrounded by barbels. Beneath each eye are defensive spines. These are used for defense. They also act as a covering for the eye and can prick quite painfully. This is reason enough to be careful when handling the pet using bare hands. The fins of the loach as well as the tail are a bright red. Along the sides of the body to the eye is a long black stripe. The pelvic fin is red and black, same to the fluke. This feature helps the fish hide in plants to evade predators. The fish also has a pointed mouth that reaches outwards. This feature helps it dig under the substrate to look for its food. When fully grown, the Clown loach can measure up to 20ch in length. It can live to be 20 years or more under proper care. Botia Macracantha, as it is scientifically known, came into the limelight in 1852. A Dutch Doctor by the name of Peter Bleeker named the fish a clown loach after distinguishing certain characteristics it possessed. This was later changed in 2004 by Maurice Kottelat, a Swiss ichthyologist. Maurice classified the fish as different from mainstream loaches and renamed its family Chromobotia. The Clown loach is native to the streams of Malaysia, Kalimantan, Sumatra and Borneo. It dwells in river tributaries. However, it moves to smaller rivers and streams when flooding occur. It also migrates upstream during spawning. In its natural habitat, the fish prefers slow moving waters with overhanging branches. Water in these kinds of environment is often boggy, appearing tea-colored. Plants, twigs and fallen leaves are likely to line these streams. Since the Clown loaches are active fish with swift movements, a sizeable tank is ideal. A 100 gallon tank should be appropriate for a group of five or six loaches. Sizeable gravel and fine sand should be placed at the bottom of the tank. For a more aesthetic appearance, gravel may be colored using other tints or painted purely white. Add enough rocks with caves to offer them plenty of hiding places. Being bottom dweller fish, floating plants are the most appropriate. Loaches can interfere with the roots of other plants. Examples of plants to be put into the tank include Taxiphyllum, Anubias, Microsorum Pteropus and plenty others. They offer a good shade for the fish. Provide a dim light. They are rather timid little creatures that are more active in darkness than in light. You should also provide a high water flow as the fish is an active swimmer and good aeration is preferred. Initiate weekly water changes to maintain water freshness and safety of fish. Bluish light may be used occasionally to inspire the fish to come out of its hiding place. This can be quite entertaining. Clowns are omnivores that feed on both plants and flesh. They accept a variety of feeds though prefer live foods. One of their favorite is worms. If worms can be harvested from the vegetable garden, the fish can heartily appreciate the gesture. A word of caution though, the worms should come from soil that was not fertilized recently. Vary the feeds to help the fish grow healthy and active. The fish can be fed twice a day or depending on its demands. Place several loaches in a tank and observe movement and behavior. Identify those that display active reproduction qualities and place them in a separate tank. After spawning, remove the adults from the tank since they consume their own eggs. After a few days, the eggs should be able to hatch. During the first few days, fry usually feed on egg sac. As they mature, they can be fed on baby brine shrimp. Later on, they can be introduced to other feeds. Raising the fry is very difficult. The likelihood of many of them dying along the way is quite high. They are relatively peaceful and may be placed with other friendly fish like big tetras, swordtails, rope fish and African cichlids. The Clown loach is an interestingly unique fish. For the first few days after purchase, a new hobbyist may be dismayed when the fish lies on a rock, acting dead. It may be scary at first but one gets to adjust to its playful ways. It also produces a whirring sound that may trouble a pet owner at first. This is one other interesting strategy the fish employs to scare away would be predators. It also uses it to startle animals it considers food. The only minus to this sound is that it lasts only a few seconds. It takes a very keen person to actually make it out. Juvenile loaches tend to be very active and funny. As they grow, some form of laziness sets in. The loach has a tendency of disappearing for several days. It can hide in one of the caves or behind plants like java fern. This may raise one’s panic mode yet it is purely normal. Without a doubt, the Clown loach is a lovely tank animal that should be a perfect consideration for the home tank.